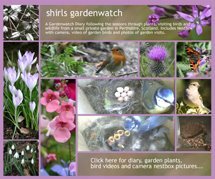 This weekend we have enjoyed some more sunshine which made a walk around Dundee Botanical Gardens all the more enjoyable. From memory I have only visited this garden a couple of times, but not at this time of year. What a pleasant walk this was. It is easy to see what caught my eye first! 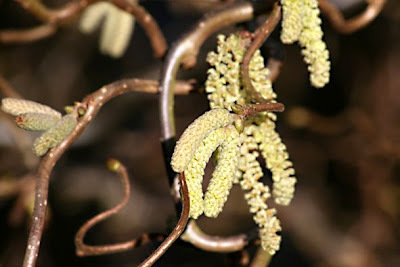 Catkins on tree branches always make me smile and these were absolute beauties! They always make me think of Spring. I just had to walk across the grass, which is encouraged here, to take some photos. They were at the edges of a small pond which had lily leaves bobbing slightly on the surface – I didn’t expect to see them growing at this time of year. Although now that I think about it there were no ducks in the water. Shades of pink blossom high on branches along the edge of a path on the other side of the pond drew me towards them but when I got closer beautiful deep plum-coloured hellebores fought for my attention hugging the ground in another border. 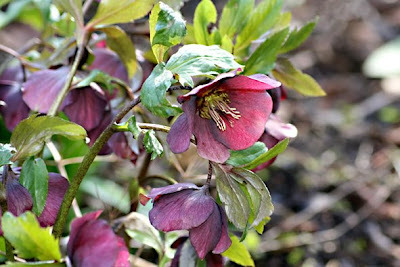 The hellebores won - I love hellebores and I am sure you can see why. 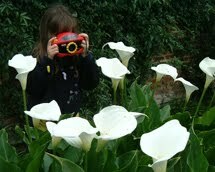 Although at a glance the garden was not lush looking, when you looked closer there really was a lot more to see. We walked up the slope towards some trees. Botanical Gardens really are a great place to see trees. Crocus growing through grass around the trunk of a tree instantly reminded of my own and the snowdrops I had seen on a walk a few weeks ago. Unlike the snowdrops they brought such wonderful colour to this spot as overhanging branches brought patterns of shade gently moving over them. I stood watching this for a while and took quite a few photos. I loved the natural planting here and the edging of copper brown leaves lying in the background. 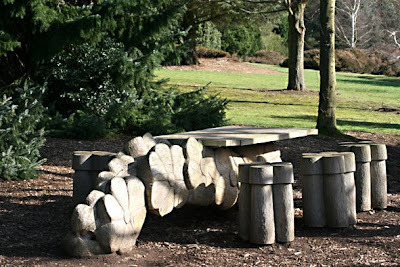 Sculptural benches and tables always find their way into Botanical gardens. I guess it is a chance to encourage local or new artists. This table above was really quite striking sitting under the shade of the trees. I enjoy seeing works of art in gardens. Trees, especially with strong trunk shapes and branches for me are the most wonderful forms of natural sculpture. I just love to see different shaped trees and I could photograph them all day! As a teenager, I spent many hours drawing trees. 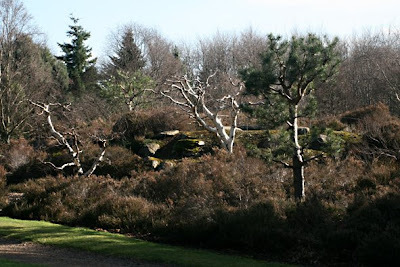 However pine trees and the ones above all twisted, especially with white bark, growing through heath for me just say ‘Scotland’. Add Celtic music to the scene above and I truly feel my heart stirred! 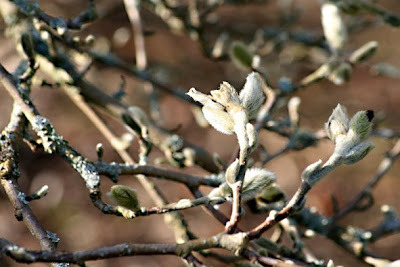 Buds forming on trees and shrubs stir all our hearts, especially gardeners, as it heralds the start of Spring and the end of the cold and long dark winter days. Again they make me smile, but seeing the lichen growing on the branches with them is just like the icing on the cake. Trees were becoming the stars of this walk for me. 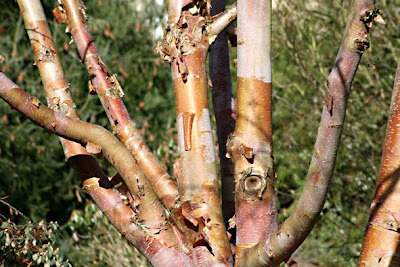 Next it was the turn of the ribbons of bark. 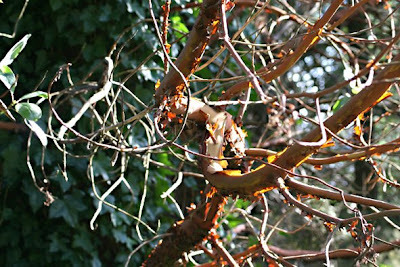 What absolutely beautiful colours and patterns as the sunshine lit them in quite different ways. Sorry, I have no names here as I was out walking with my family and as I was already stopping to take photos every now and again I thought it would be seriously pushing it to take a notebook out too! Bursts of colour would draw me off the main paths and across the grass with my camera. I couldn’t believe I came across a rhododendron in flower. From this viewpoint you could look across and over the small airport of Dundee to the River Tay which was glistening in the sunlight – although it was a bit wild looking as it was windy. Joining the main path I was now standing in front of a tree that I do remember seeing before. 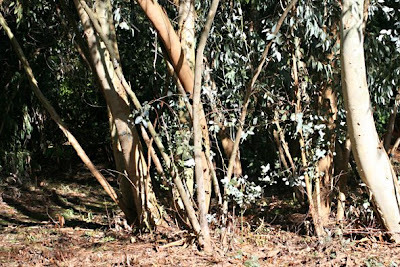 This eucalyptus tree and the most enormous girth of shoots I have seen – the photo above shows just half of them. I would take a guess that in its younger days this tree has been coppiced (cut to the ground each year) to promote new growth. The leaves of the new growth are much more interesting to look at too. Heading along the main paths and back into the garden once more and it was the forest planting of trees that caught my attention next. Sunlight filtered through these trees and on to the carpet of copper brown leaves on the ground. It really was like a painting. 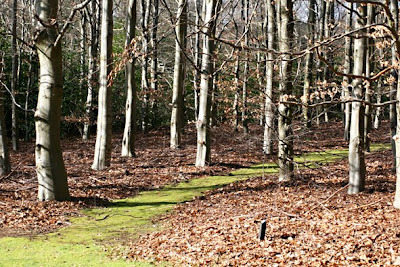 It looked like every tree had been perfectly spaced, the paths placed with a designers eye and the leaves looked like they had been deliberately blown to make the carpet fit perfectly. However, it also looked completely natural. The paths in the first photo above were of grass but very surprisingly the path up the middle of the second photo was purely of moss. I wonder how they did that. Perhaps it wasn’t deliberate but it looked fantastic however I don’t know how it could survive a lot of foot traffic. Walking towards the entrance of this garden and I wonder if you have noticed what was almost missing from my photos? Yes, snowdrops! There were small clumps dotted about the garden but the one above at the edge of the path caught my eye as the sunlight spotlighted a few flowers. How pretty it looked. What else was missing? You may be able to tell from my photos but it is sound you need for this one. 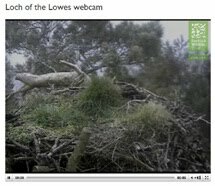 We didn’t hear birds singing – not one! 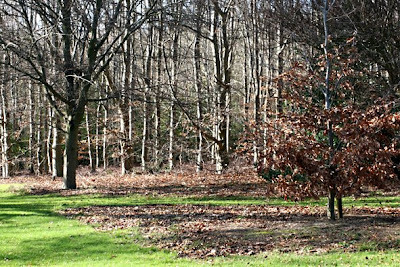 I did spot one bit of movement in a bush but for all the trees, heath and shrubs in this garden we never saw any wildlife. Initially we didn’t notice this as we were chatting but it was very strange once we realised. I’m sure there has to be wildlife but perhaps it chooses to be secretive at this time of year. Finally, if you also enjoy seeing trees and are visiting or living in or around Perthshire you might be interested to hear that it is known as Big Tree Country. 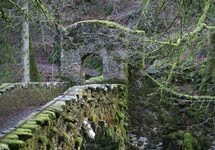 You can check out the website for guided walks and more information. As for this garden, I look forward to visiting again to see how it changes through the seasons. 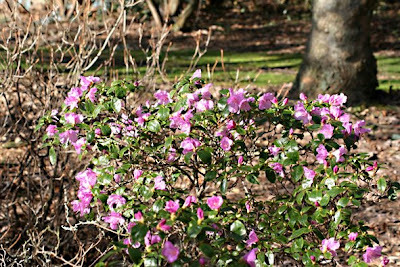 The photos above were taken at The University of Dundee Botanical Garden on March 1st 2008. Every year I think I will put crocus into the lawn. It is such a pretty sight growing that way. I too like catkins. 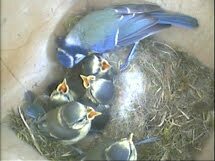 They look so lively swaying in the wind. Thanks for taking us along with you on your tour. Your blog today was so informative and beautiful. I am like you and notice all the elements in a garden--from the form to the flowers. It's all good!! Thank you for sharing such beautiful pics. I would visit if I were close by. Great post, how beautiful pictures!!! Hope I could visit that and so many beautiful gardens all over! What a very beautiful place Shirl. Thanks for taking us along! Thanks, Shirl for taking us along on your wonderful walk. The trees, crocus, hellebores and snowdrops were stunning, but that sculptural table and benches were eye popping! Was it shaped like a dragon? 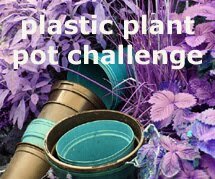 By the way, I have a mystery you may be able to help me with that was posted today, if you want to come on over to Faire Garden and take a look! Loved the photos in this post. I have been to these gardens but a long time ago. Your post has encouraged me to re-visit them soon. Wonderful photos Shirl, I can see what attracts you there looks a great place, Mike. This was a great tour. 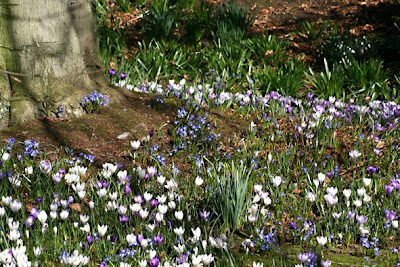 The botanical gardens look as if they are a wonderful place - the crocuses popping up are beautiful ... I love benches, so it was good to see some here. The Hellebores are gorgeous. I think they are fast becoming my favourite spring flower. I can understand why you loved the trees. Thank you for this interesting tour. I like botanical gardens too. The crocus lawn is beautiful and it really looks like Spring! 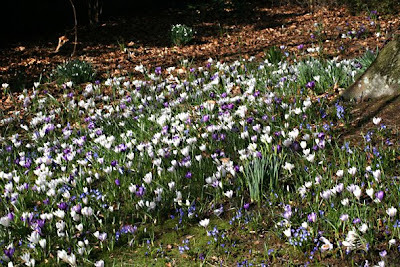 While Snowdrops are my favorite early bulb, those white Crocus interplanted with the blue flower is so pretty! You remind me that I haven't been to the Cambridge botanical gardens yet this year - I must go before the Winter Garden goes over completely. 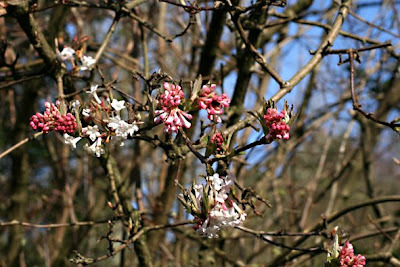 I have never been to the Dundee Botanic Gardens but what with all your lovely photos I feel as if I have paid a visit. All the information on the photo montage process is appreciated too, as I have not tried to display mine in that way yet. Your walk through the carpet of snowdrops at Dalmeny Park had me salivating for more. 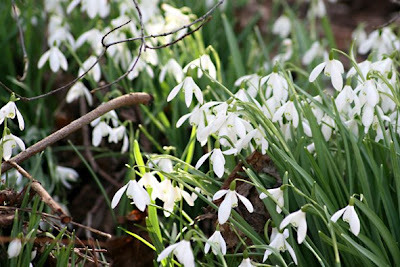 I do love snowdrops, and invest in a few more bunches each year. 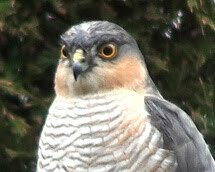 Your garden bird photos are always a treat. The close-ups are so detailed. I love the one of the song thrush, as it can be very difficult to identify them. What wonderful pictures! Thx for sharing them. I especially fond of those hellebores! Thanks for the lovely walk in the Dundee botanical garden! It looks great at the mo.